The title “Bad Samaritan” embodies the essence of this story and captures the contrasting nature of the main characters. From start to end, there’s a strange feel towards the leading character Sean Falco (Robert Sheehan) and a sense of panic towards the second leading character Cale Erendreich (David Tennant). The two characters couldn’t be more polar opposites even when they have so much in common with their willingness to go to moral gray areas to survive. During a press conference for “Bad Samaritan” Tennant talked about researching serial killers to get into the right mindset for the role. Even thought the background of a serial killer can inform the audience to tendencies and reasons for the abnormalities that cause the mentality of a serial killer, the story deliberately is vague with overly explaining the background and rather let’s the audiences’ minds wander to get to a conclusion for the strange behavior. Writer Brandon Boyce said that the audience can appreciate that not everything is explained and can be creeped out by the story they make up from the bits and pieces of information that are given. 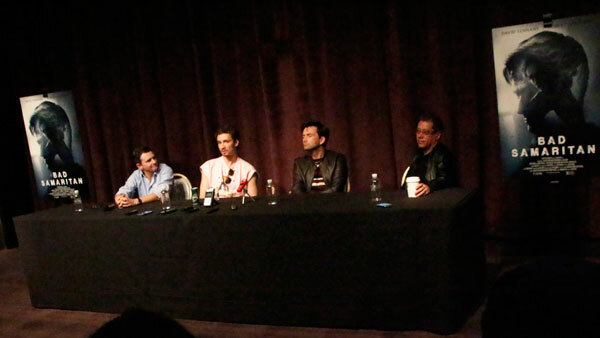 As much as the script was well written, director Dean Devlin said that having both Sheehan and Tennant as the lead actors made these characters really come to life, as well as capturing the rural setting. The thrill of the cat and mouse game which turns and at points can make the audience confused as to who is being hunted and who is the hunter. The entire story, the cast and the filmmakers come together fantastically to create a thrilling, thought provoking story which intensified dramatically from beginning to end.